Discover the White Mountains, by Jerry & Marcy Monkman, 2nd Edition, 2009. 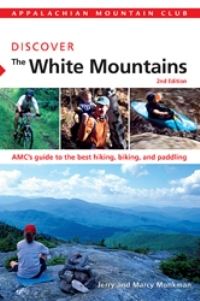 Revised edition of this thorough, informative and user-friendly guide to the outdoor pleasures of the Whites, with fine descriptions for a diverse selection of 30 hikes, 20 mountain bike rides and 11 quiet and whitewater paddling trips. Also includes local & natural history, a trip highlights chart, and many other useful features. Good maps & photos. 368 pp, 6" x 9".